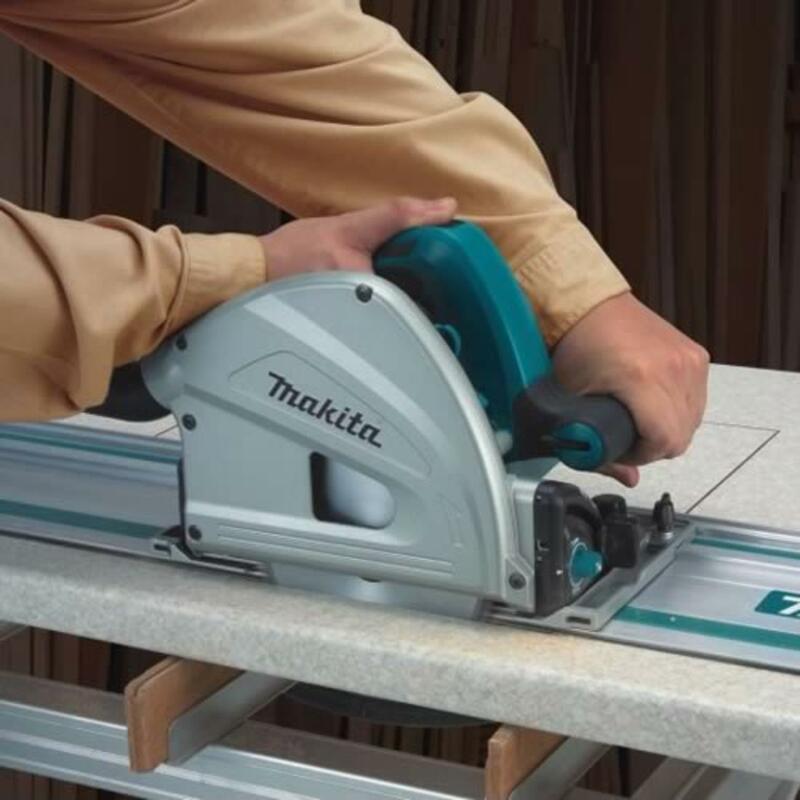 The Makita SP6000J1 plunge cut circular saw together with its guide rail offers amazing cutting accuracy, versatility, and value for money. The SP6000J1 has a 165mm diameter blade givingimpressive 55mm max depth of cut and can also cut 39mm at a 45° angle, the powerful 1300w motor produces a 5800rpm max no load speed for excellent cutting results. Soft start eliminates sudden movement on start up that may misalign the position of the rail and electronic speed control maintains a constant smooth speed for a cleaner finish. The depth-stopper provides splinter-free cutting. Contained within a protective systainer case the SP6000J1 is an impressive alternative to its most popular rival. "feels sturdy and sets up easily enough but when it came to using it... ripping some 18mm plywood on the rail, so naturally set the depth stop to 18mm. realising it was not deep enough I had to then set the depth to 21mm to make a full pass. 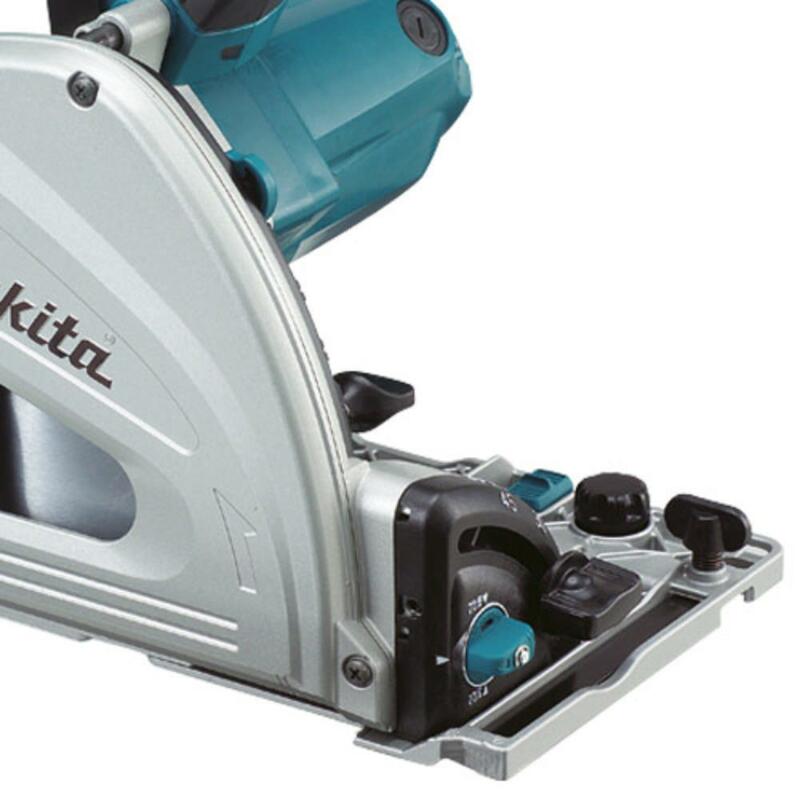 when I spoke to Makita about this the engineer spoke to me like an idiot "what do you expect? we don't set it up for the rail" Makita's advice is to set it up on a test and mark it with tipex! well worth the �400 price mark. I'm a die hard Makita fan but this is silly. a rail saw that lacks precision on the rail! 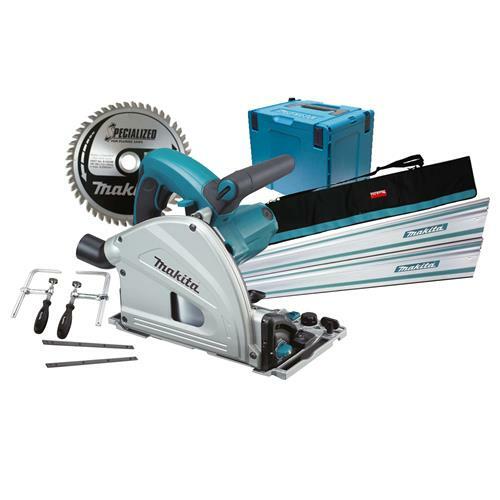 sorry Makita I'm moving to festool." "As a kitchen/bedroom fitter,this is a great set. 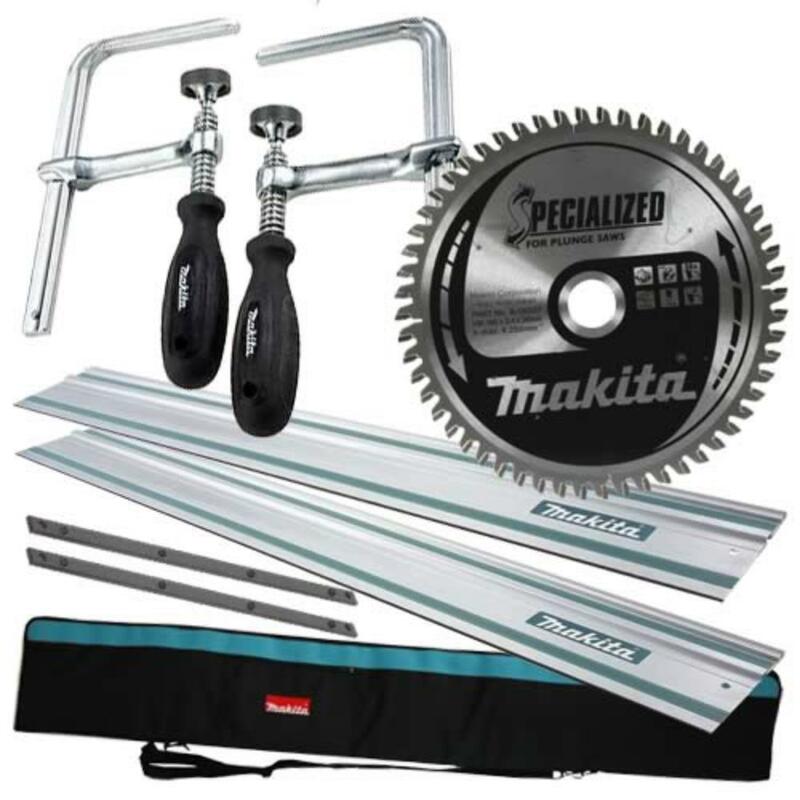 Buy makita blade not cheap ones, you can't go wrong. " "Absolutely brilliant product. Have been steadily changing all my power tools over to Makita after buying a few of their smaller products from ITS and finding them extremely good value for the increase in quality over previous manufacturers. I was well impressed not just by build quality but design. For example, the rail guides have a rubber edge that is oversized so that the first time you use it the rubber gets cut to the exact edge of the saw blade which you then can use to precision cut your sheets. It's inspired me to take on more ambitious joinery projects as I can guarantee perfectly straight and square long cuts which previously would have been hit and miss. ITS service was once again perfect and very easy." "As a kitchen fitter this saw is invaluable, plunge cut outs ,panel sizing all very precise and easy. A back stop clamp to prevent kick back,(provided by rival brands) is not available for this? Blades provided worked well but cutting oak work tops did reduce the life of the blades very easily. Altogether a cracking piece of kit, what did I do without it? " "Brilliant bit of kit wouldn't be without it. Well worth every penny"
"Not had chance to use it much yet, but a cracking machine." "Briliiant bit of kit could not be without it would highly recommend it to any1 thinking of getting one. Also best package deal price." "Great system & great saw......used for cutting down worktops & panels.....easy to use & can't wait for next job I need it for !!!" "I have used this saw a good few times now and in my opinion it is just as good as the Festool for accuracy and quality of cut. the fence is a takes a little more messing about but isn't really an issue and the depth adjustment has less thumb turn as oppose to a spring loaded one. i would reccomend this saw over the fes as it is just as good has the same warrenty and is cheaper, try to fault that!! "